Organized with the special cooperation of the Nara National Museum, the assistance of the Kyushu and Tokyo National Museums, and the generosity of lenders across Japan, Shinto: Discovery of the Divine in Japanese Art presents works associated with belief in divinities called kami (pronounced kah-mee). Shinto means “way of the kami.” As the second part of the exhibition’s title suggests, we hope you visit to discover for yourself the divine in Japanese art in both the spiritual and the material senses. Among the 75 works from nearly two dozen Japanese lenders, 20 objects are designated Important Cultural Properties (ICP) by the Japanese government. In order to enjoy these pieces, visitors must come at least twice during the run of the exhibition, as each work will be displayed for only six weeks: either from April 9 to May 19 or from May 23 to June 30. Some of the artworks have not been seen in the United States since 1976, when they traveled to New York and Seattle for an exhibition organized by the Kyoto National Museum. Others have never before left Japan and are rarely exhibited. 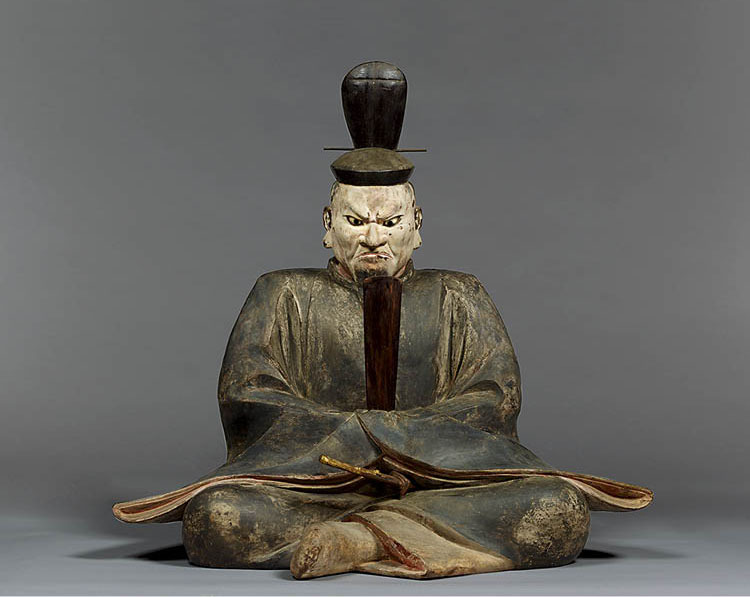 Two highlights are mid-13th-century wood sculptures of Tenman Daijizai Tenjin (“Celestial Deity of Great Power Filling Heaven”), the deified form of the Japanese courtier Sugawara no Michizane (845–903). On view in the first rotation is the sculpture of Tenjin from Yoki Tenman Jinja, a shrine near the Buddhist temple Hasedera in Sakurai, Nara Prefecture. 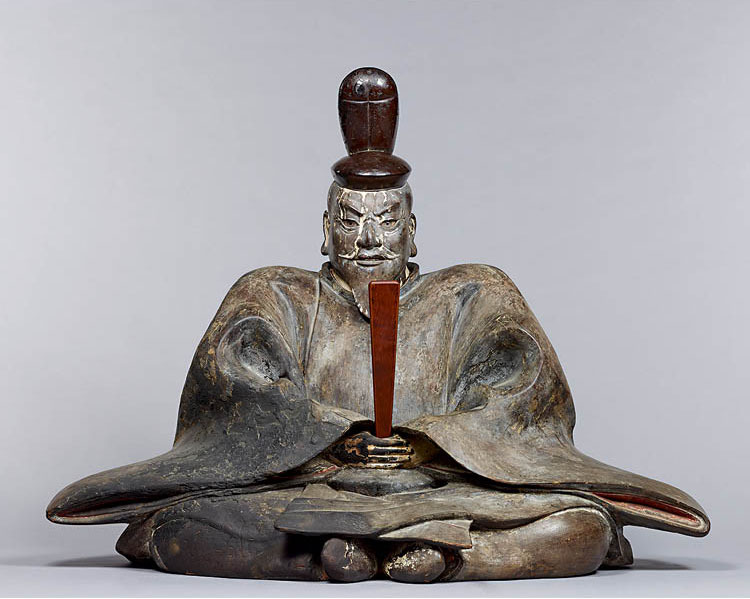 Featured in the second rotation is the Tenjin sculpture that is the mishōtai (deity body) of the shrine Egara Tenjinsha in Kamakura. Both are designated ICP. Among the other works related to the kami Tenjin are three ICP from the shrine Hōfu Tenmangū in Yamaguchi Prefecture: two illustrated handscrolls from a six-part set dating to 1311 that relate the story of Michizane and his deification, and a lacquer writing desk and writing box of black lacquered wood with designs in gold powder. The composition of renga (linked-verse poems) as a rite of devotion to Tenjin, revered as the kami of literature and learning, has historically been an important feature of worship at Tenjin shrines around Japan. In addition, a miniature lacquer shrine represents the legend of Tenjin crossing the sea to visit China. Belonging to Sata Tenjingū in Moriguchi, Osaka Prefecture, this shrine treasure is customarily given a public viewing once every 25 years; it was last on view in 2001 in Japan, but the shrine’s head priest has made a special exception for this treasure to travel to Cleveland. As well as providing tremendous logistical support to the exhibition, the Nara National Museum is a major lender, especially in the area of applied arts with ICP designations. Among such works are a set of two boxes with unique iconography believed to be related to the worship of water in its incarnation as a Dragon King at Kasuga Taisha in Nara. 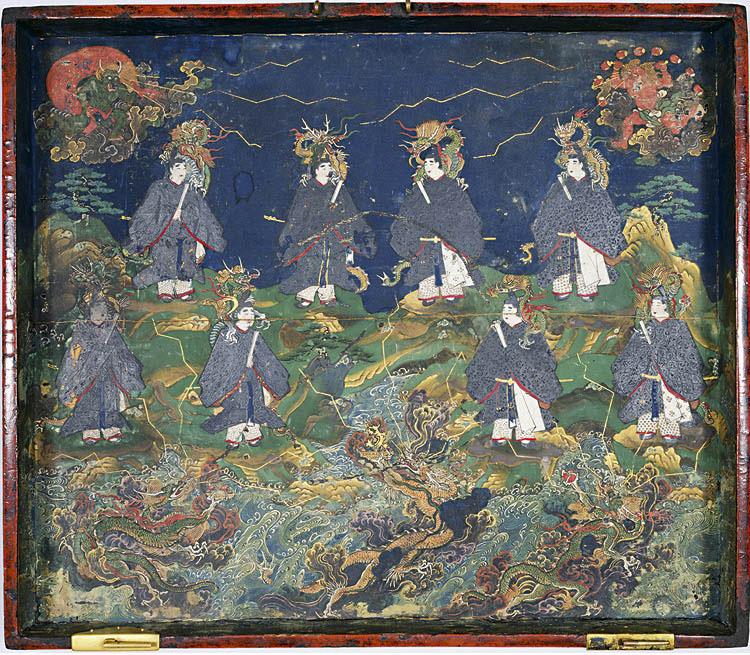 The boxes, their surfaces showing the five kami of Kasuga along with a panoply of other deities, as well as dragon and water motifs, are believed to have held jewels belonging to the Dragon King. The exhibition also includes a substantial group of artworks from collections in the United States. This marks the first time major works of Shinto art from US collections have been brought together, as well as the first time they appear alongside masterworks from Japan. One fortuitous reunion occasioned by the show is of a group of statues thought to have originated in a shrine on the island of Kyushu and now spread across one Japanese and three US institutions. Generally considered to date from the 10th century, the sculptures of the kami Hachiman and associated deities represent an early phase of creating shinzō (sculptures of kami). Another treat is the chance to see the two early 14th-century narrative scrolls that form The Illustrated Miraculous Origins of the Yūzū Nenbutsu School. One scroll belongs to the CMA, and the other to the Art Institute of Chicago. 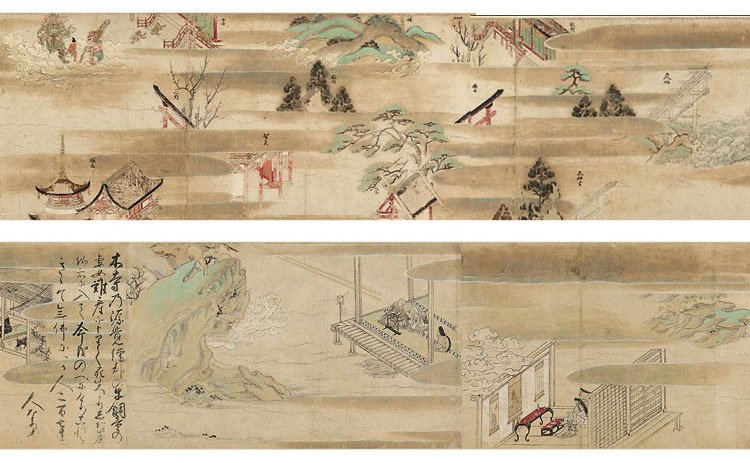 The set is among the most important emaki (illustrated handscrolls) outside Japan. The Illustrated Miraculous Origins of the Yūzū Nenbutsu School (Yūzū Nenbutsu Engi Emaki), 14th century. Kamakura period (1185–1333). Set of two handscrolls; ink, color, and gold on paper.